I wanted to share my experience with the installation and testing of the new nitrous system made by Zex. A list of my mods can be found here. The kit is a "Dry" type nitrous spray. A "Dry" kit does not install additional fuel injectors, the stock injectors are fired under more fuel pressure to add more fuel when the nitrous is flowing. The kit comes complete with everything needed to do a thorough install. 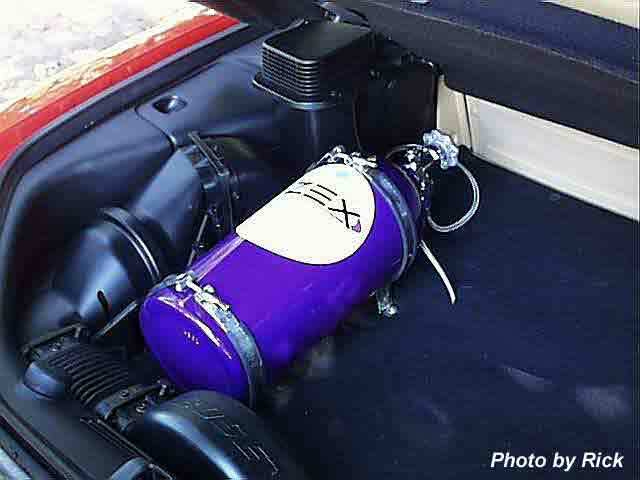 Provided in the kit are nitrous and fuel jets for a 55, 65, or 75hp shot. I started with the 55. I had previously installed an AutoMeter AFM and an Intellitronix Fuel Pressure gauges to monitor and make sure plenty of fuel was available. I also have the RP Upgrade Fuel Pump. The kit itself is a very a straight forward install. I ran into no major problems. I mounted the bottle in the back hatch area. The bottle had to be tilted at an angle for proper operation. The mounts for the bottle were supplied and provide for the proper angle. I ran the nitrous supply line through and small hole drilled just to the left side of the spare tire. I ran the supply line in the same conduit that covers the brake lines. The control box was mounted next to the N-Tech Battery Miniaturization Kit. The provided supply line length was more than enough. 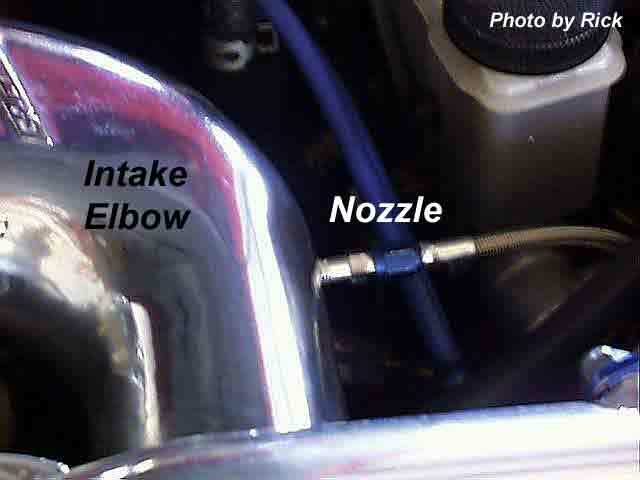 I mounted the nozzle at the GReddy intake elbow, just right before the throttle body. The elbow was thick enough to drill and tap for the nozzle. I pointed the nozzle in the direction of the airflow. I had thought about installing it before the IC to help chill the air, but was told that it would be more responsive right at the throttle body. 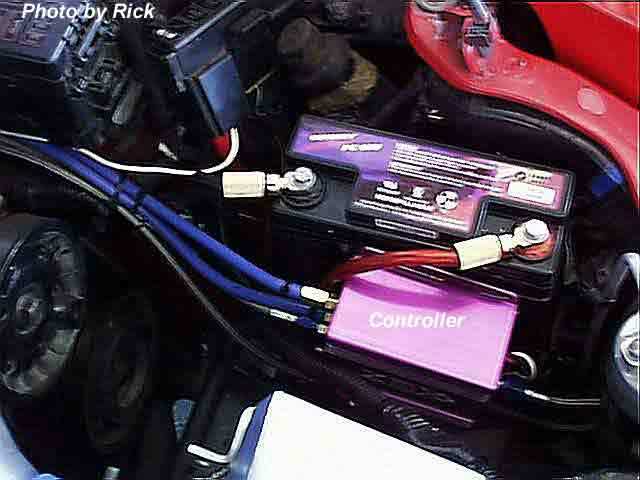 The connection for additional fuel was simply a matter of taking the OEM hose going to the fuel pressure regulator and routing it to the Zex controller. Another hose going out of the Zex went to the OEM regulator where the hose was removed. I used silicone fuel hose and routed it away from any heat sources as much as possible. I was very concerned about fuel pressure being increased when nitrous was being sprayed. The electrical portion of the install was easy. Power and ground is right at the battery. I had to run the arming switch inside the car. I mounted it on a plastic panel just under the steering wheel. Once armed, the system is ready operate. The nitrous is not released until 4.6vdc is seen off the TPS. I had to run a wire to tap into the TPS. I did have to adjust my TPS during this process. My TPS adjustment was off. Once everything was installed and the bottle filled, I had to do a few pre-flight checks first. I took the line off at the nozzle and turned the ignition on with the engine off. I pointed the NOS line up and out of the engine compartment. I secured it so it would not fly around once I hit the gas. I depressed full throttle and NOS sprayed. Make sure your assistant is not holding this line with his bare hand. I did have a minor leak inside the control box. I opened it up and found a fitting was not properly tightened. Once the leak was repaired, I could finally make a run with the nitrous. I had no way of testing for increased fuel pressure with the bottle turned off. The system references off the bottle pressure. With my assistant's hand still numb from the super cold nozzle fitting, we set off in search of an open stretch of road. We decided to turn the PRofec B off and run default spring pressure on the wastegate. I recorded 10 psi on an initial run without nitrous. During all my testing and starting out with a bottle only about 2/3 full, I only had a few pounds of nitrous left. Zex claims 3 min. on a 55 shot. I found that if you are into the gas for more than 3 seconds, you are flat out cruising. I armed the nitrous on the next run. Running at 10 psi, I monitored the AFM and my assistant monitored the fuel pressure. I did a rolling start and hit full throttle in 2nd gear. The nitrous was clearly felt. It came on real smooth and strong with no hint of detonation. My AFM indicated two bars down from full rich (0.9 Volt). Fuel Pressure showed 59 psi with nitrous as opposed to 49 psi without. I later made a run at 12 psi and saw same AFM readings and 61 psi. It appears the the Zex tries to keep the enrichment of fuel 10 psi over and above the OEM increase while in boost. I have further testing to do with a full bottle. I feel like the system is well engineered and working as advertised. The car feels real strong with even a 55 shot.